The excitement begins for the Loyola Ramblers continues as the team prepares to embark on the Final 4 competition. NBC 5's Chris Hush has the details. The Final Four is set, with Loyola University still dancing for the first time in decades. The Ramblers became just the fourth 11-seed to reach the Final Four since 1979 on Saturday after defeating Kansas State, 78-62. Prior to this year's NCAA Tournament, Loyola hadn't reached the Final Four since 1963. The city of Chicago is buzzing over the Ramblers' run, with people lining up at Loyola's bookstore to buy Final Four gear on Sunday - a line that will surely be a steady stream all week before the next game. Fans also got an up-close look at the regional championship trophy Sunday as players returned to campus to a massive reception welcoming them home. Head coach Porter Moser said he's proud of his team and beyond pleased with the ongoing support. "Not too long ago, I was passing out hot dogs asking people to go to the games," Moser said following Saturday's victory. "Fliers, dorms, I mean, you name it, I did it with the students, trying to get them to come," he continued. "And now, to see them now, I've had alumni come up in tears and bear hug me. That means so much to me. 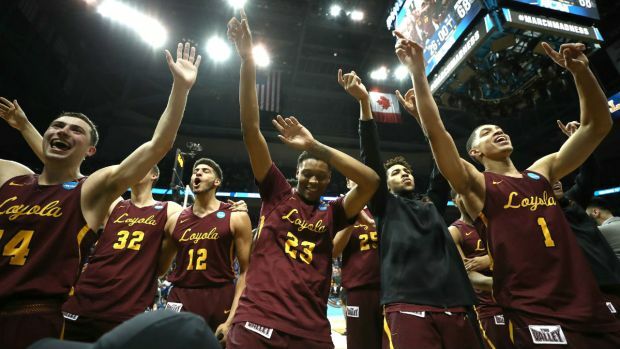 The Loyola Ramblers will take on the University of Michigan Wolverines in the national semifinal on Saturday, squaring off in San Antonio at 5:09 p.m., with the game airing on TBS.